Marlo is salty not just because she’s without her arsenal of outlandish outfits, but because she’s wearing glued-in hair, and is worried it won’t last. Alongside the outfit changes were wig changes. Or maybe Marlo’s hair and makeup people were also lost in customs after being strapped into a Gucci Hold-All? I’m just going to imagine Marlo sitting there with a bottle of Elmer’s, adhering Go Naked strands to her head. If she’s really lucky maybe the hotel has a hot glue gun? Eva came to Kandi for advice on how to deal with Porsha. Yep, it’s so obvious Eva really cares about rebuilding good communication with her so-called friend if she’s going to Porsha’s enemy for solutions. Kandi, to her credit, also reminds Eva that her major problem is not Porsha’s shade drones, but Eva being shady behind people’s backs, then sweet to their faces. Eva Denies Being The Shadiest Housewife; Plus Which Housewife Does She Want Back On RHOA? 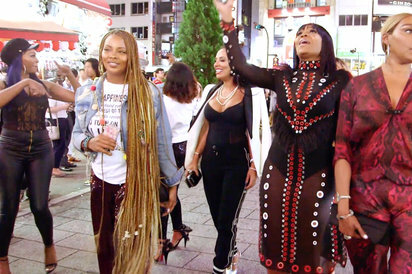 Fast forward to that first Japanese dinner… While Kandi and NeNe make faces and sneer at the Japanese American fusion food – apparently guacamole and tomatoes are too weird for them? – Eva announces that she wants to nip any lingering issues in the bud. Like for instance she thought Porsha was her friend, then Porsha came for her at Hibachi night. Porsha was just standing up for Shamea Morton, though, who Eva has been dogging behind closed doors. And Cynthia Bailey who has a right to know that Eva is also dogging her career. Marlo comments that Eva has been talking about her “like a cat” too. The cat on Eva’s back who has no shoes, but nine lives funded by nine mysterious black AmEx cards. Finally Eva’s co-host Tanya Sam stands to introduce their Japanese travel host, like this is a presentation to potential investors. NeNe is visibly annoyed. The Japanese hostess makes a it very clear that being ON TIME is a major cultural value, and warns the ladies that to be late is to be incredibly rude. NeNe knows all about how rude these girls can be … 5 hours rude, 4 hours rude, missing the whole trip rude… Which makes me think she’ll be the first one ready to go the following morning. HA. Then comes the last and final announcement. 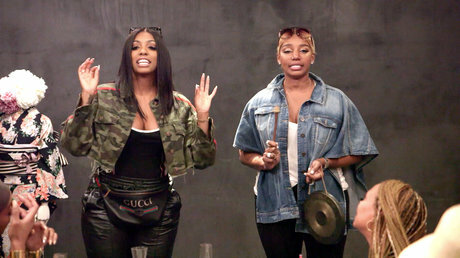 This time from Porsha – in Japanese and accompanied by whipping off her fanny pack to unveil her baby bump! Before leaving Atlanta, Porsha told NeNe that she was past the 12-week mark in her pregnancy and ready to tell people. Plus it’s not like she can get through another trip without drinking without people noticing! Porsha secretly asked the concierge how to say “I am pregnant,” in Japanese, hands NeNe a gong, and shares the news. Unsurprisingly even Porsha’s haters are thrilled. Dennis McKinley being a horrible cheating, serial tattooer be damned – everyone agrees Porsha will be an excellent mother. After all she’s on the same brainwave as toddlers! Porsha is fully embracing pregnancy: the non-stop eating, the excuse to be lazy about whatever you don’t want to do, and most importantly, blaming her out of whack hormones for all her bad behavior! Girl it only lasts 9 months… then what? The next morning Eva knocks on Kandi’s door seeking champagne to help her deal with the devastating news she just received: her grandfather had a heart attack and is now on life support. Eva is expecting her mom to call at any moment to say that he’s passed. Poor Eva. So sad especially on a trip that’s supposed to be a non-stop party. Kandi isn’t sure how to comfort Eva – especially since she has morning breath and doesn’t want to get too close. Despite all this, Eva is still on time to meet their tour guide at the bus to visit an ancient temple. Tanya is dressed like some sort of strange anime character and it is not a good look for an 11am tour of a temple, but at least she is on time. Unlike Shamari who is 30 minutes late (but does look great – and appropriate – for once! ), NeNe who is 45 minutes later, and finally Marlo who is in a furious mood because no one helped when she had nothing to wear and hair that needed scotch taped. Marlo did manage to be wearing something Gucci, so maybe she spent the morning shopping? Apparently she forgot to buy a bra because she complained about not having one! NeNe is annoyed by Marlo’s selfish attitude, because she was late due to fighting with Gregg. Plus Eva is also stressing over family matters, yet here is Marlo, complaining on and on about her wardrobe. NeNe is at her wits end with Gregg and is actually relieved to have a break from him after all the stress they’ve been under dealing with his cancer. Gregg is constantly in a bad mood, which he projects onto NeNe, who struggles to remain calm and helpful. Frankly NeNe is tired of being his emotional punching bag. Kinda interesting because I feel like Gregg has been NeNe’s emotional punching back for most of their marriage, and now the tables are turned. I could be wrong though! Also why do I feel like NeNe and Gregg are just in a constant state of Hangry after switching their diets to vegan. HA. 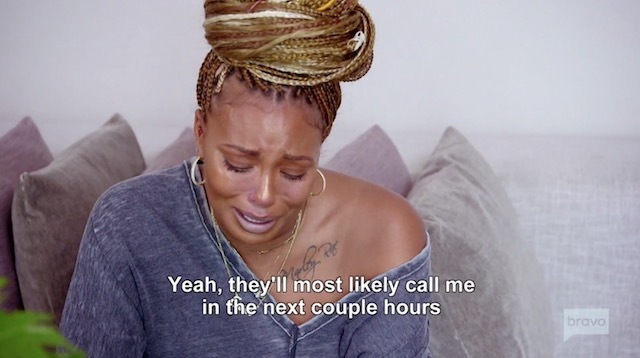 After learning about Eva’s grandfather, Porsha has decided she no longer cares about any of their issues and just wants to be there to support her frienemy – or whatever Eva is. The Japanese hostess describes the temple as sacred and “very instagrammable,” two things which are not related in any way – kind of like every single thing Eva wears! The hostess also explains that out of respect they must be quiet inside. NeNe seems mysteriously annoyed with Tanya again. Is she still cranky over the so-called Swagg insult? Even though Tanya apologized. Tanya keeps reminding everyone to follow the tour guide’s advice (to avoid being arrested for prostitution as Eva almost was when she was modeling in Japan years before), but every time Tanya speaks NeNe gets stank-face. It’s imminently clear that Tanya is too classy and intelligent for this group. I wish we would be blessed with more Housewives of her ilk, but I doubt she’ll stick around for next season and we’ll get more Marlos of the world instead. Get it together Bravo! The first stop at the temple is to get their fortunes read, which was my favorite part of the episode. Porsha’s prediction says she will welcome new life in the spring. Kandi’s financial fortunes will improve with the help of her family, and Eva gets reaffirming news about her own family. Tanya is told she will get married… Marlo takes this as a sign that Paul Judge will finally convince Tanya to plan their wedding, but NeNe snipes that maybe she’ll marry someone else instead! Learn More About Tanya’s Past & Her Relationship To Paul! 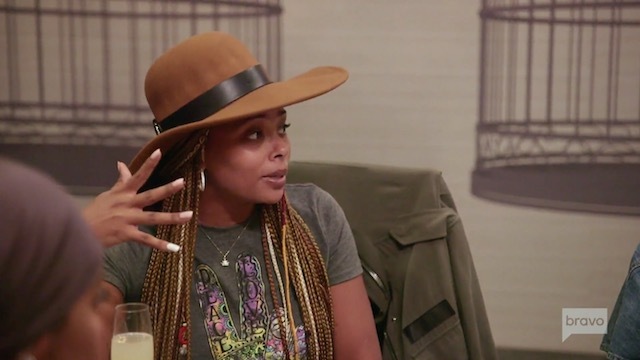 Tanya argues back that NeNe is being really negative about her life choices – especially since they are supposed to be friends and confidantes. Instead of being empathetic, NeNe freaks out and starts screaming at Tanya about how she doesn’t know what marriage really means. Not that NeNe cares! Nope, not at all! Tanya and the other women are stunned. Suddenly the rawest fish in the room is Tanya… Dang, NeNe is taking out all her Gregg-angst on others and it isn’t pretty. 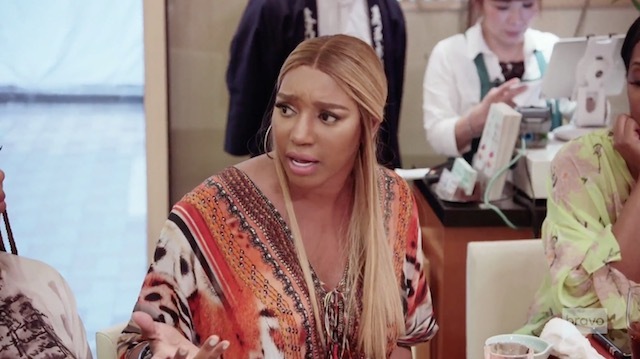 TELL US – IS NENE PROJECTING ONTO TANYA? WHY? WILL EVA AND PORSHA BE ABLE TO REBUILD THEIR FRIENDSHIP?